Ryan assists his students. Copyright © 2016, FPP, Inc. All rights reserved. The OnShape Tech Workshop, conducted by Ryan Evans of D-Ring Design Works, brought out the inner tinker in all participants; it was like playing with virtual Lego Blocks or Tinker Toys! Designs created using OnShape are mappable—or translatable, or importable—to other, large-scale CAD software programs; this means that an individual designer (e.g., an independent consultant) might be able to “sketch” out a design using OnShape, and then transfer that design to a customer (e.g., a client using SolidWorks) so that that customer’s in-house design team might add more extensive—or proprietary—features. The lab ended with participants wanting more: to complete their model. Ryan emailed his students a finished version of the hole punch device so we could work on our own, within our individual accounts to match our hole punch design with his finished model. Ryan’s Hole Punch Design. Copyright © 2016, FPP, Inc. All rights reserved. 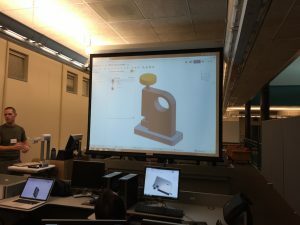 After attending this Tech Workshop and the preceding Tech Talk on Tuesday, I believe that participants now have a better understanding of how to use CAD solid shape modeling software, with the added bonus that the concepts, commands, and workspace mimic other software IDEs, thus lending an additional level of comfort with digital CAD tools. Thanks to Ryan for introducing a new group of users to such a marvelous tool! Ryan demonstrated a deep understanding of his subject while at the same time having the ability to return to his once-newbie level and relate to the current plight of his students. His depth and breadth of knowledge and experience were on display as he guided his students through their individual learning curves. And thanks to all attendees for their participation in the workshop! The next Tech Workshop is on the subject of Swift, Apple’s new programming language. The lab will be conducted by the team of Dave Hendrix and Eric Turner, and held in Marion Ady Room 003 (MA003) on the Second Thursday in February: the 11th, from 3:30 – 5:30 p.m. Following the Swift Lab, all participants are invited to The Brickroom for the monthly meeting of CocoaHeads, the local Apple Aficionados networking group. Copyright © 2016, FPP, Inc. All rights reserved.